This paper describes aspects of the 2012 7 Southeast Asian Studies (7SEAS) operations period, the largest within the Maritime Continent. Included were an enhanced deployment of Aerosol Robotic Network (AERONET) sun photometers, multiple lidars, and a Singapore supersite. Simultaneously, a ship was dispatched to the Palawan Archipelago and Sulu Sea of the Philippines for September 2012 to observe transported smoke and pollution as it entered the southwest monsoon trough. Atmospheric oxidation of isoprene in the presence of acidic sulfate aerosol yields substantial SOA. Potential adverse health effects resulting from exposure to this aerosol type are largely unknown. Measurements of gene expression of known inflammatory biomarkers interleukin 8 (IL-8) and cyclooxygenase 2 (COX-2) in exposed human lung cells at the air–liquid interface showed that a dose of 0.067 μg cm−2 of isoprene SOA leads to statistically significant increases in IL-8 and COX-2 mRNA levels. The source, formation, transformation mechanisms and mixing state of particulate matter (PM) in high episodic events under different meteorological conditions in Hong Kong remain unclear. With high-resolution time-of-flight aerosol mass spectrometric measurement, we successfully demonstrated the dynamic and complex nature of PM transformation during high-PM episodes. This study revealed that not only regional transport but also local secondary formation is the culprit for high PM levels. We provide BVOC emissions for the present scenario, employing the updated ORCHIDEE emission module and the MEGAN model. The modelling community still faces the problem of emission model evaluation because of the absence of adequate observations. The accurate analysis performed, employing the two models, allowed the various processes modelled to be investigated, in order to fully understand the origin of the mismatch between the model estimates and to quantify the emission uncertainties. The aim of this paper is to present STEFLUX, a tool to obtain a fast-computing identification of the stratospheric intrusion (SI) events occurring at a specific location and during a specified time window. STEFLUX results are compared to the SI observations at two high-mountain WMO/GAW global stations in Nepal and Italy, representative of two hot spots for climate change. Furthermore, the climatology of SI at the two stations is assessed, and the impact of several climate factors investigated. The interactive effects between inorganic and organic species under highly complex pollution conditions remain uncertain and were studied in a smog chamber. This study indicated that the synergistic formation of secondary inorganic and organic aerosol might increase the secondary aerosol load in the atmosphere and contribute haze pollution in eastern China. These synergistic effects were related to the heterogeneous process on aerosol surface and need to be considered in air quality models. Sky imager cameras provide a full view of the sky with high spatial and temporal resolution and are used to derive cloud cover, cloud type or cloud-base height, if employed in a stereo configuration. The application of a dense fisheye stereo method provides dense, consistent and quite complete 3-D cloud boundaries and can be fully automated. We present validation of our approach and cloud examples with high geometric complexity. Applications are radiative closure studies and cloud dynamics. Data observed during the Green Ocean Amazon (GoAmazon2014/5) experiment are used to derive the large-scale fields in this study. The morning propagating convective systems are active during the wet season but rare during the dry season. The afternoon convections are active in both seasons, with heating and moistening in the lower level corresponding to the vertical convergence of eddy fluxes. Case study shows distinguish large-scale environments for three types of convective systems in Amazonia. We developed the surface flux intensity calculation method based on 2-year continuous ground measurement at a cross-boundary site between Beijing and the NCP to investigate the surface regional transport. The long-term and multispecies observation demonstrated the regional transport influence of the megacity Beijing and the NCP on Yufa. Our study has a direct implication in air quality control measures implemented in Beijing and its surrounding areas. Emissions from inland shipping were studied at the Rhine. Reliable NOx and PM emission indices are prerequisite for improving emission inventories. The NO2 / NOx emission ratio from the present study points to ship engines without exhaust gas aftertreatment as main emitter. The calculated NOx emissions of all motor ship types were found to be above the threshold values of national German guidelines. Accordingly, the implementation of efficient NOx reduction techniques is strongly recommended. How do air ions reflect variations in ionising radiation in the lower atmosphere in a boreal forest? Ionising radiation is responsible for air ion production. However, minor efforts have been invested in understanding the connection of observed air ions to ionising radiation in the lower atmosphere and underlying processes therein. In this work, we analysed 4 years of ambient data collected in a Finnish boreal forest and found that gamma radiation dominates air ion production in the lower atmosphere and demonstrated clear promotion effects of the ionising radiation on air ion production. In this paper the evolution of deep convective clouds is simulated under different aerosol loading. The simulations are performed using a spectral-bin microphysics model in which droplet concentration at cloud base is calculated using a new analytical method. The effect of this accurate calculation of droplet concentration is analyzed by comparison with a standard method. The role of the smallest CCN in the aerosol spectra is investigated. Here we show observational evidence that aerosols increase upper tropospheric humidity (UTH) via changes in the microphysics of deep convection. Using remote sensing data over the ocean east of China in summer, we show that increased aerosol loads are associated with an UTH increase of 2.2 ± 1.5 in units of relative humidity. We show that humidification of aerosols or other meteorological covariation is very unlikely to be the cause for this result indicating relevance for the global climate. This study has investigated the effect of retreating sea ice on Arctic cloud cover in historical simulations by the coupled atmosphere–ocean general circulation model, MIROC5. This study show that MIROC5 simulates retreating Arctic sea ice in September during the late 20th Century, which causes an increase in Arctic cloud cover in October. Sensitivity experiments using the atmospheric component of MIROC5 also proved that the increase in Arctic cloud cover is due to the retreating sea ice. Vehicular emissions have a strong impact on air pollution in big cities; hence, the study was performed in São Paulo city, where light- (LDVs) and heavy-duty vehicles (HDVs) run on different fuels. We find that organic aerosol emission from LDVs and HDVs is a complex process involving oxidation of fuel constituents, NOx chemistry, and condensation of unburned fuel hydrocarbons on new or existing particles. The obtained emission patterns can be used to study processing of young aerosol in Brazil. We used a box model to study the sensitivity of ozone production by different precursors within the Houston metro area during NASA's DISCOVER-AQ air quality field mission in 2013. We constrained the box model to observations from the campaign and to a 3-D model for species that were not measured. By focusing our analysis on different locations and times of day within the metro area, we were able to suggest which ozone precursors, if controlled, would have the greatest impact on ozone reduction. There are many studies which show discrepancies between modeled and measured nitrous acid (HONO, precursor of OH radical) in the troposphere but with no satisfactory explanation. Ideal conditions to study the unknown sources of HONO were found on Cyprus, a remote Mediterranean island. Budget analysis of trace gas measurements indicates a common source of NO and HONO, which is not related to anthropogenic activity and is most likely derived from biologic activity in soils and subsequent emission. Wildfires emit organic carbon aerosols, small particles suspended in the atmosphere. These aerosols may cool the climate system via interactions with sunlight and clouds. We have used a global climate model to investigate the cooling effects of these aerosols. We find that ignoring interannual variability of the emissions may lead to an overestimation of the cooling effect of the aerosols emitted by fires. Atmospheric black carbon (BC), commonly known as soot, is an important constituent of the earth that imparts a warming similar to that of carbon dioxide. However, BC is much shorter lived and has uncertain warming due to its mixture with other solid and liquid components. Here, advanced microscopic methods have provided a detailed look at thousands of BC particles sampled from central California; these measurements will lead towards a better understanding of the effects that BC has on climate. We present the development of a high-resolution time-of-flight chemical ionization mass spectrometer (HR-ToF-CIMS) method, utilizing protonated ethanol as reagent ions to simultaneously detect atmospheric gaseous amines (C1 to C6) and amides (C1 to C6). Deployment of this ethanol HR-ToF-CIMS has been demonstrated in a field campaign in urban Shanghai, China, detecting amines (from a few pptv to hundreds of pptv) and amides (from tens of pptv to a few ppbv). Methane is an important greenhouse gas, which accounts for about 20 % of the warming induced by long-lived greenhouse gases since 1750. Anthropogenic methane emissions from China may have been growing rapidly in the past decades because of increased coal mining and fast growing livestock. 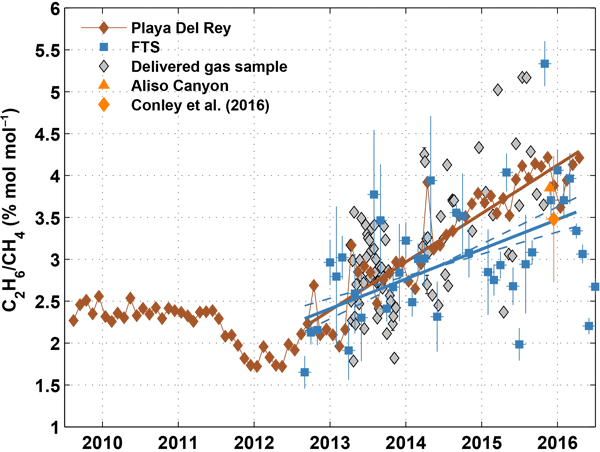 A good long-term methane emissions dataset is still lacking. Here, we produced a detailed bottom-up inventory of anthropogenic methane emissions from the eight major source sectors in China during 1980–2010. We present a method which uses global measurements of stable stratospheric trace species to infer stratospheric circulation. This method finds the circulation vectors which best satisfy the continuity equation for the given measurements. Some of the main disadvantages of more conventional methods are avoided. As a proof of concept, this method has been applied to measurements from the MIPAS instrument. Its adequacy has been proven since the inferred circulation shows the expected features. The article introduces a new method for determining the evaporation rates of small molecular clusters based on cluster concentration measurements. Evaporation rates cannot be measured directly or computed very accurately from any classical or quantum theory, so the presented method will give new understanding about molecular clusters. In addition, it can give some information about what happens to clusters during the measurement process. The hydroxyl radical (OH) is known for removing various pollutants from the atmosphere. Chemistry–climate models disagree on how much OH is found in the atmosphere. Here we use a single column model, set up for Lauder (New Zealand), to assess how OH responds to correcting model biases in long-lived constituents and temperature. We find some considerable sensitivity to correcting water vapour and ozone, with lesser contributions due to correcting methane, carbon monoxide, and temperature. High abundances of formic and acetic acids in the snow pit samples (6 m in depth) collected at a snowfield site near Mt. Tateyama, central Japan. Formic and acetic acids are highly abundant in the snow, with dust layers in which Ca was enriched. We propose that alkaline metals in Asian dusts largely titrate gaseous organic acids during long-range atmospheric transport. The Metropolitan Area of São Paulo is the biggest megacity of South America, with over 20 million inhabitants. In recent years, the region has been facing a modification in rain patterns. In this study, we evaluated the effects of local and remote sources of air pollution on cloud-condensation nuclei activation properties. Our results showed that the local vehicular traffic emission products presented more negative effects on cloud-condensation nuclei activation than the remote sources. Continuous measurements of CO2 fluxes were conducted using the micrometeorological method at three locations in Sakai, Osaka, Japan, evaluating CO2 fluxes from five landscapes: a dense urban center, a moderately urban area, a suburb, an urban park, and a rural area. Irrespective of the land cover type, all urban landscapes acted as net annual CO2 sources, with emissions ranging from 0.5 to 4.9 kg C m−2 yr−1. The magnitude of the annual CO2 emissions was negatively correlated with green fraction. We performed field measurements and controlled field experiments to examine the flux, temporal variation and influencing factors of air–surface Hg(0) exchange at a high-altitude and remote site in the central Qinghai–Tibet Plateau. We found that the environmental conditions greatly influenced the air–surface Hg dynamics. Our results have important implications for the Hg biogeochemical cycle in the soils of Qinghai–Tibet Plateau under rapid climate warming and environmental change.